No wedding is complete without its highs and lows of surprising and shocking moments. But, the much awaited and hyped wedding of Manchu Manoj has only seen highs throughout the one week of ceremonies, not just for the family but for the Telugu industry as well. 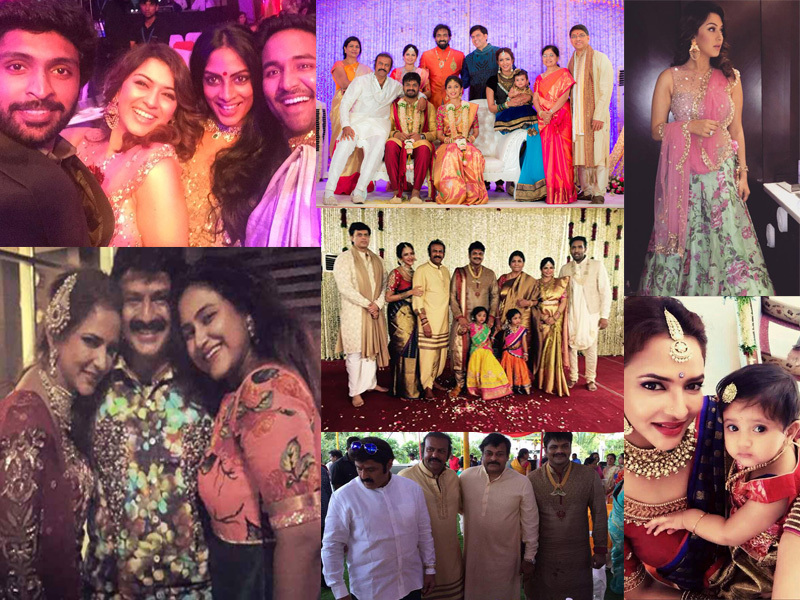 Before Manchu Manoj could complete his yedu adugulu around the fire with his fiancée Pranathi Reddy, seven wonderful moments have already occurred due to his marriage. 1. Firstly, during the sangeet ceremony that had occurred on the night of 17th May, actors such as Arya, Vikram Prabhu, Trisha and Hansika among others had put up a show for the Manchu family. They all contributed to the happiness of the sangeet by dancing for the bride and groom. 2. Standing at two is the rumored rekindling of love between Rana and Trisha. The two were spotted together, chatting in a corner and seemed to be having a good time. The two are either moving forward or moving on with their lives. 3. The third important news is the fact that Manchu Lakshmi seems to be the one handling and hosting all the events of her dear brother’s wedding. Even though her recent release “Dongaata” might have not cashed in as she might have expected at the Box Office, this wedding has her smiling! 4. So, if you sense a strong fragrance of the Jasmine flower when you are travelling, be alert! Apparently, jasmine is the flower of the wedding season for the Manchu family as they have only used jasmines as decoration for all ceremonies from the engagement to the wedding. 5. The fifth-most shocking event that has occurred in this wedding is the reconciliation of Balayya, Chiranjeevi and Mohanbabu. The two actors had always been rivals when it came to cinemas or politics and were never seen having a conversation together. However, at the Manoj Pellikoduku function, the duo were spotted embracing each other, laughing and having a great time. I know! I can’t believe it either, but pictures do speak more than my words. 6. Sixth on this list is the major reason behind why this wedding is being celebrated on such a grand scale. It is, in fact, the last wedding of this generation in the Manchu’s family. Hence, the wedding invitations were sent to the biggies of not only the Telugu industry, but also to various Bollywood personalities and politicians. 7. On an ending note, the biggest highlight was when all the guests saw Mohan Babu shake a leg at the sangeet ceremony. Mohan Babu, who is generally very composed and serious, started dancing on stage with other Telugu actors and the guests loved it! Now that my “seven wonders” list has been completed, the only thing left to occur is the actual wedding taking place at 9:20 a.m. on 20th May. Although the location of the wedding has been kept under the veil, you could follow the scent of the jasmines to figure the venue out.